Our community pick of the week is an easy and quick tart recipe submitted by anne hermes. 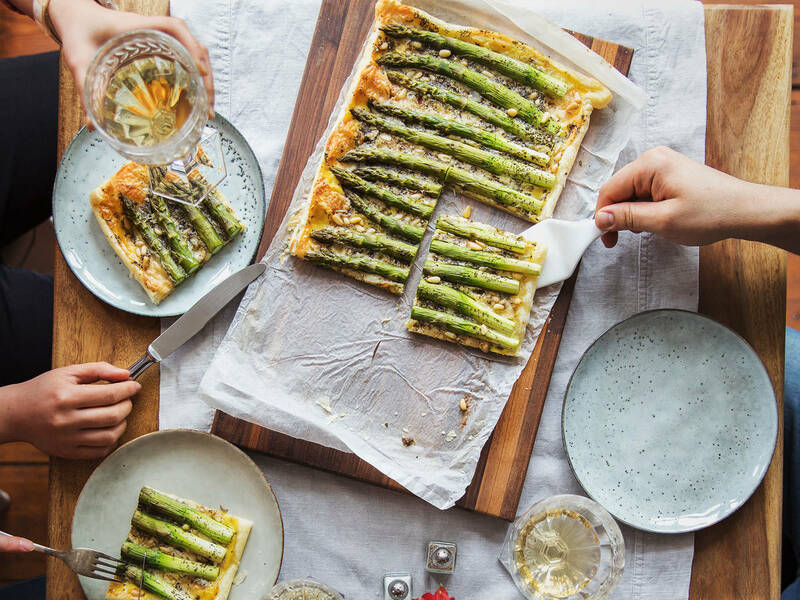 The star ingredient is none other than green asparagus, baked with pungent Gorgonzola cheese on a sheet of buttery puff pastry with herbs and garlic. What’s so special about this tart? A warm welcome to asparagus season, this tart gets you out of your usual asparagus soup and salad routine. Because of the ready-made puff pastry, the tart is extremely quick to prepare, making it a good choice for weeknight dinner, light lunch, or a starter at your next dinner party. Leftovers (should there be any…) reheat easily in the oven or microwave—so make your colleagues jealous and even take it into the office for lunch! Tender green asparagus and rich Gorgonzola are a match made in heaven, only elevated by a garlicky pine nut crunch and flaky pastry. Our Kitchen Stories test team praised the tart as “super simple, yet trés élégante” and “an ideal combination of flavors.” According to the Kitchen Stories team, it’s a winner. This tart can feed two, maybe three, as a main dish without additional starters or sides. Planning a dinner party? Why not chop it up to bite-sized pieces! We reckon you can get 24 pieces, comfortably serving at least 12 hungry guests. Whichever way you opt to eat this tart, we’re sure you’ll enjoy it! If you’ve created a special seasonal recipe for spring, why not share it with the Kitchen Stories team and our hungry community? Simply send your recipe to community@kitchenstories.com.